It's time to go Topsy Turvy, pilot. And Dr Boom's Rush to all mechs! This card has a really cool Easter Egg from Star Wars: A New Hope. When the bombers (Gold squad) are raiding the Death Star, Darth Vader goes to kill them one by one. When he is going to kill the second one, the other pilot says to the one about to get killed "Stay on target" two times, and then before dying he says "They came from...behind". Have little use other than a surprise attack paired with Rockbiter Weapon, Flametongue Totem or Power Overwhelming. Or just junk like Junkbot. Well, maybe it isn't really good card, but it definitely can have some use. Looks like Thrallmar Farseer and Windfury Harpy will have a new friend to keep them company in the trash bin. PRO ART!! Coolest mech yet? It's in the race! 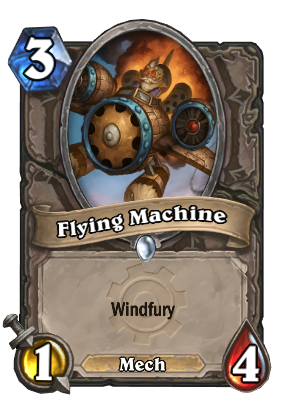 Gyrocopter's name was changed to Flying Machine in Warcraft 3 (in the Frozen Throne expansion), s it's still a reference to it. Oh, and Corky model copies the One in W3, as LoL is based on DotA which was originally a custom map in W3.